The TrekRanks Podcast goes deep into the Delta Quadrant to select their Top 5 High-Concept Voyager Episodes. Our hosts Jim Moorhouse and Jeff Hulit are joined by Adam Hunault and Brandon-Shea Mutala to contrast and compare many of Voyager&apos;s biggest and best episodes. The deep-dive conversation is TrekRanks first to tackle Voyager&apos;s epic seven season run of broad and bold sci-fi conceits. The result is another great episode for fans of deep cut Trek selections. 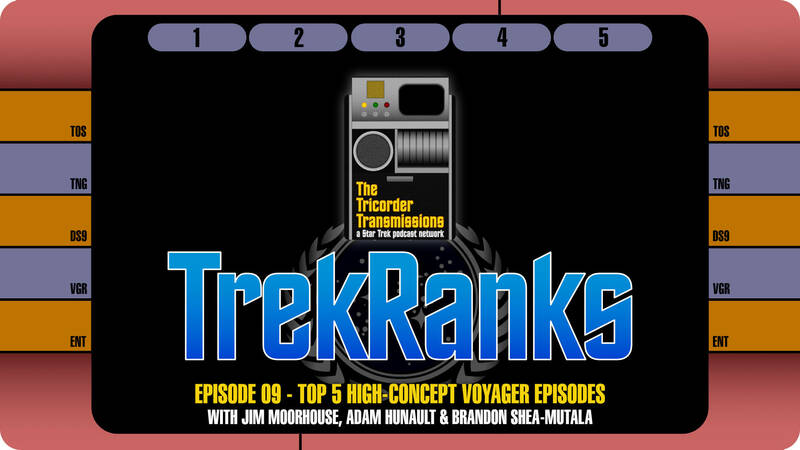 Jim, Adam and Brandon-Shea break down their final picks in The Order of Things by revealing their "Five Word Summary and Hashtag" for each of their Top 5 High-Concept Voyager Episodes. The resulting discussion highlights one of the most understated truths in Star Trek lore: that Voyager led the way for Star Trek in terms of big ideas and outlandish science fiction constructs. From orbital tethers and Species 8472, to transwarp conduits and "weird planets displaced in time," Voyager literally has it all. After a quick recap of all the picks in the Regeneration Cycle, the episode concludes with a visit into a Temporal Causality Loop as we flashback to Episode 8 for listener feedback regarding our Top Five Data Episodes.